The Eagles Palace and Spa Hotel is on the third and most romantic of Halkidikiâ€™s peninsulas, Mount Athos, adjacent to the charming village of Ouranoupolis. The area surrounding this five-star hotel combines a golden sandy beach, crystal clear seas, green clad hillsides and, of course, the mystical Mount Athos itself (Mount Athos is just two and a half miles away). 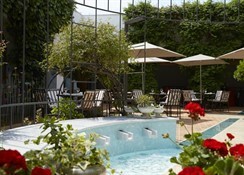 Extensive gardens filled with olive, palm and pine trees, beautiful flowers and herbs surround the hotel. A varied selection of room options is available from elegant twins with sea or garden views through to private bungalows and even spacious suites with their own private pool.On the blue flag beach in front of the hotel you can enjoy numerous water sports and there is a PADI certified scuba diving centre suitable for beginners or experienced divers alike. There is an anchorage spot for boats just offshore and guests can make full use of the hotelâ€™s sea transfer and boat hire service so you can visit nearby beaches or the picturesque island of Ammouliani. A good way to see Mount Athos is by boat and this can be arranged at the Eagles Hotel.The Eagles Palace and Spa features an outdoor saltwater floatation pool and a children's swimming pool as well as a mini club (for four to twelve year olds) which opens from 10am to 6pm daily. There is also a childrenâ€™s playground where they can run about and let off steam. For the energetic adults out there the hotel has a fitness centre with state-of-the-art Nautilus equipment and a Powerplate as well as the opportunity to play a game of tennis or join in with some beach volleyball. 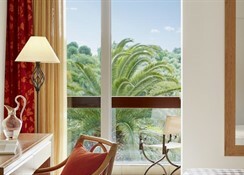 For those in search of something a bit more sedate why not visit the hotels Eagle Spa by Elemis. Offering a variety of therapies and treatments from around the world for men and women, the spa is the ideal location or rest, relaxation, revitalization and pampering. With hot and cold water therapies, facials, massages, detox programmes, cellulite treatments and day packages, as well as a sauna, steam room, Jacuzzi, adventure shower and two single and one couple treatment rooms, spa lovers will be in heaven.Your dining needs are also well catered for at the Eagles Palace with a wide variety of restaurants and bars serving international cuisine and local specialities using only the finest local ingredients. 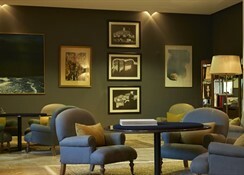 Guests of the Eagle Palace also benefit from an onsite jewellery store, a boutique with international press, tobacco and gifts, wireless internet and a business centre, regular art exhibitions and wine tasting and live music in the bar during the evening. There is also a chapel for weddings or christenings. This hotel will appeal to couples and families looking for a high standard of accommodation and service. 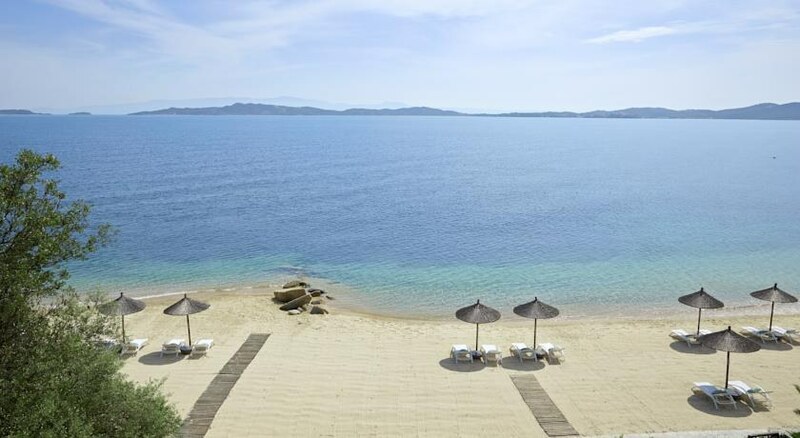 From the spacious elegant guestrooms to the excellent leisure and dining facilities, everything at the Eagles Palace and Spa Hotel has been designed to ensure you have a superb holiday on the beautiful Greek island of Halkidiki. There is a large seawater pool on the lower level of the hotel area just above the beach. Next to the pool you will also find a shallower pool for children. Alternatively, just a few steps further will take you onto the blue flag beach which is equipped with free loungers and parasols. Both the beach and the pool are serviced by bars with lucky sun worshippers on the beach able to order a snack or a drink just by pressing a button on the umbrella table next to where you are relaxing. 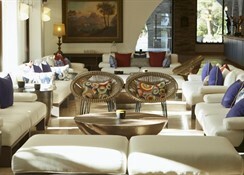 There are numerous wining and dining options at the Eagles Palace and Spa Hotel. Kamares offers the ultimate dining experience either inside or on a breathtaking sunset terrace. The restaurants international menu is lovingly prepared using only the best local products whilst you enjoy the breathtaking views across the sea and the island of Ammouliani. Armyra by the pool is a great spot for lunch or dinner. For lunch it is a smart Greek tavern serving traditional Greek food before transforming at dinner time to a slightly more formal restaurant serving the finest seafood in a romantic setting literally on the beach under the stars. The relaxed main restaurant, Melathron offers casual dining experience for breakfast and dinner buffet style or for a taste of Asia try the Vinum Restaurant where they prepare the finest sushi maki with jumbo prawns, pineapple and Shiso, or salmon and kiwi, Sea Bass Nigiri, Salmon Sashimi with marinated finochio, soya sauce and wasabi, all from an open kitchen so you can see the chefs at work. For refreshments, the Armyra Pool Bar has a swim up area so you can enjoy drinks and cocktails from the water whilst those on the beach can get food and drinks delivered to their lounger from the Ammos Beach Bar or wander over to the bar itself for a variety of light snacks, drinks, ice-cream and fresh fruits. The Eagles Cafe and Courtyard is a great spot to have early morning coffees, snacks, pastries and cakes anytime of the day or head for the Eagles Club Bar for cocktails, sunset views and live music. Wonderful place with small private beach & great pool. Went end of season so hardly anyone else around, but the sun was still shining. Hotel is in the middle of nowhere so if you like walking around the local area forget it. Hotel does offer shuttle bus to local fishing village, but really not worth the trip. 2 hours drive from airport, but views lovely on the way (very expensive transfer price). Very relaxing and staff really helpful, but you are a captive audience and they know it - restaurant prices were extortionate. That said, I was happy to help the local economy, but I would not go again.